Celtic Design Titanium Ring : LOVE2HAVE in the UK! 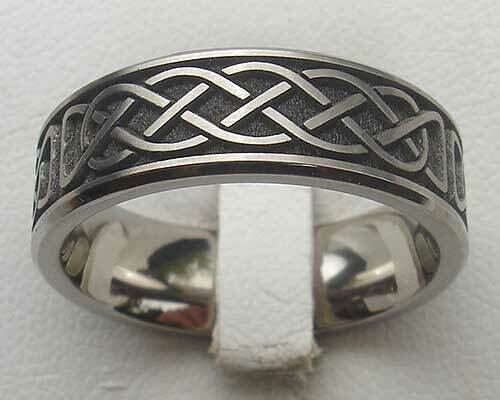 This Celtic titanium ring is another example of the outer engraved Celtic titanium rings we sell. Rather than being very detailed, it features a more straightforward, yet bolder weaved Celtic style design that sits proud of the pitted titanium. The woven pattern is divided and appears repeated around the ring. The edging of the ring has a slightly bevelled profile that catches the light, and it is flat in profile. All in all, a very stylish, understated, and modern Celtic ring.